In 2007, Jim received the ASP Gold Medallion Award from the American Society of Photographers for his Loan Collection album entry “Messengers to the Creator.” His album was also chosen as Album of the Year by Professional Photographers of America. In 2008, Jim was the first to receive the ASP Gold Medallion Award twice for his album entry “The Otter Family”. In 2009, Jim received the ASP Regional Medallion Award for his album “Great Coastal Brown Bears” which scored a 100 at the Mid-America Regional Conference. In 2010 Jim received a 100 for his album “Yellowstone: Backcountry Journey” at the Mid-America Conference. He was again the recipient of the Regional Medallion and the Canon Par Excellence Award. In 2012, Jim became a Fellow of the American Society of Photographer. In 2007, 2008, 2009, 2011 and 2012 Jim won Photographer of the Year at Professional Photographers of Indiana. He has held the Indiana Digital Imager of the Year title 2004, 2005, 2006, 2008, 2009 and 2011. In 2003, Jim won the Photographer of the Year title at the Mid-East States Regional print exhibit in Columbus, Ohio. He is a three time Photographer of the Year at the Indianapolis Professional Photographers Guild. Jim is also the recipient of the Imaging Excellence Award from Professional Photographers of America for over 26 Loan Collection Images. Jim has placed in the Top Ten Indiana photographers the past fifteen years. Jim’s image “Majestic” was selected to receive the Foveon Award at the 2001 Mid-East States Regional Convention, then was selected to be a part of the American Society of Photographers’ Photographic Hall of Fame. Majestic was then selected to appear on the 2001 Loan Collection Book cover. He is a five time winner of the Professional Photographers of Indiana Platinum Award for Best of Show with the highest scoring image; three of which scored 100. In 2004, 2005, 2008 and 2011 he received the ASP State Elite Award for the highest scoring image. Jim is a nationally approved photographic exhibition judge for the Professional Photographers of America. Jim’s program will look inside his camera bag. 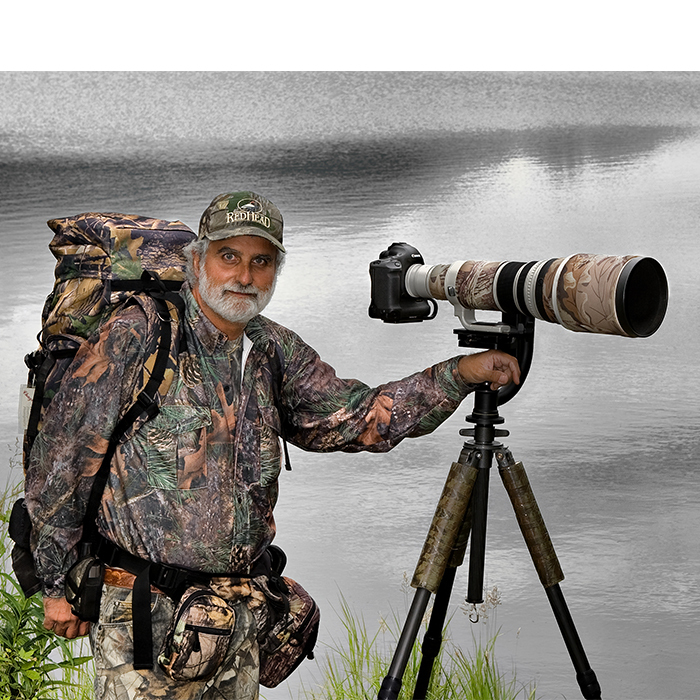 He will discuss the equipment he uses to create his images from cameras, lenses, binoculars, GPS and other accessories. He will share his auto-focus techniques and camera settings for creating perfect exposures with fast moving subject and ever changing lighting conditions. He will also share his undocumented techniques for creating the sharpest images imaginable. Jim will demonstrate his postproduction Photoshop techniques that will make your images rival others. He will take you through the deep recesses of Photoshop. If you know Photoshop well enough to get around, but aren’t using many of the advance features, this program will prove invaluable in raising your awareness and skill level to new heights. The latest insider tips will teach you how to create and edit images with expert results. Learn how to apply techniques to real-world situations.